Sandy’s eclectic, alignment-based hatha/flow yoga classes blend over 20 years’ in-depth experience in a rich variety of major yoga traditions, including a strong Iyengar foundation, mixed with elements of Vinyasa, Ashtanga, Kripalu and Restorative. 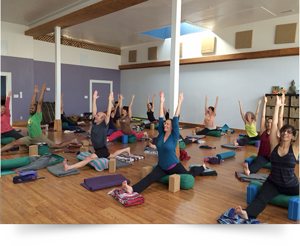 Each class is a mini-immersion in a particular aspect of practice, focusing on a theme for the day. She encourages students to honor their own needs while also striking a balance between practicing what is challenging for change and growth, and what is fun and comes easily for joy.